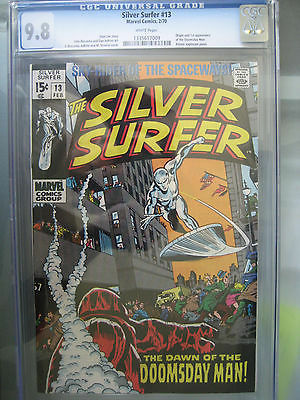 This near pristine CGC 9.8 NM/MT is the single highest graded example of this Silver Surfer issue. Why this book has proven so tough in the highest grades is a mystery, but it is well known to collectors of this popular late-Silver Age run. With more than 15 years of CGC grading it is remarkable that this is the only example of this issue to be assigned this lofty grade and who knows when another one will reach the necessary standards. Adding to the desirability of this example, CGC has assigned its perfect White page quality designation, which means that this is not only the only example of this issue in grade, but also the best 9.8 attainable. Silver Surfer has long been one of the most popular characters in Marvel's stables and his self-titled run continues to attract collectors. "The Dawn of the Doomsday Man!" With the threat of the Doomsday Man, a powerful robot built by Dr. Kronton to be the US Army's ultimate defensive robot. However after the robot was completed, the military decided they had gone too far and sealed the robot into a large concrete prison on an uninhabited island. When news of the robot being activated makes national headlines the Surfer decides to get involved and try to stop the robot to save humanity, despite their opinion of him. When offering his aid, the United Nations agree to let the Surfer try and defuse the situation but send Dr. Kronton along with them. Soon the Surfer learns that the Kronton intended the robot to become free and that he had armed it with a Cobalt Bomb in hopes that it would reach the United States and demand a ransom. However, when the Surfer tries to trap the Doomsday Man in the Earth's core, Kronton tries to save it, but the machine ends up killing him. With the Doomsday Man trapped in the Earth, the Surfer throws the Cobalt bomb into space where it detonates safely. However, in spite of the fact that the Surfer saved the Earth, the people watching the Surfer's battle blame him for allowing the Doomsday Man to kill Kronton. Instead of defending himself, the Surfer silently walks away from the scene. Please Be Sure To Check Out My Ebay Store! Free Express Shipping with Full Insurance! CGC Comics will be shipped padded in Express Box or similar. International shipping will vary. Payment is expected within 5 days. Thanks for peeking!